The constitution provides for freedom of religion, and the Government generally respected this right in practice. There was no change in the status of respect for religious freedom during the period covered by this report, and government policy continued to contribute to the generally free practice of religion. The generally amicable relationship among religious groups in society contributed to religious freedom. The U.S. government discusses religious freedom issues with the Government as part of its overall policy to promote human rights. The country has an area of 109,483 square miles and a population estimated at 12.2 million in 2001. The Catholic Episcopal Conference estimated that 85 percent of the population was Roman Catholic, with 35 percent of Catholics actively practicing. Some groups, particularly indigenous people who lived in the mountains, followed a syncretic form of Catholicism that combined indigenous beliefs with orthodox Catholic doctrine. Saints often were venerated in ways similar to indigenous deities. In the Amazonian jungle region, Catholic practices were often combined with elements of shamanism. The Gospel Missionary Union estimated that there were one million Protestants in the country. While Protestant conversions traditionally have been among the lower classes, there were growing numbers of professionals converting to Protestantism. Southern Baptists, the Church of Jesus Christ of Latter-day Saints (Mormons), Jehovah's Witnesses, Presbyterians, and Pentecostals have successfully found converts in different regions, particularly among indigenous people in the Sierra provinces of Chimborazo, Bolivar, Cotopaxi, Imbabura, and Pichincha, especially among persons who practiced syncretic religions, as well as in groups marginalized by society. Other popular evangelical groups included the Assembly of God in urban areas and the Church of the Word of God, which was growing rapidly in indigenous areas. In general, rural indigenous areas tended to be either entirely Catholic or entirely Protestant. Hundreds of evangelical churches existed, and many of them were not connected with a particular denomination. Some multidenominational Christian groups, such as the Gospel Missionary Union, the Christian and Missionary Alliance, and Hoy Cristo Jesus Bendice, have been active for more than sixty years. Many of the religious groups registered with the Government had very small numbers; these included Anglicans, Baha'is, Episcopalians, Lutherans, Presbyterians, and the Unification Church. Other groups present in small numbers were Muslims, Jews, and adherents of Eastern Orthodox religions. There were also followers of Inti, the traditional Inca sun god, and some atheists, but there were no reliable statistics on the size of these smaller groups. In big cities, Protestant mega-churches, with more than ten thousand members, were a growing phenomenon. There was a high percentage of mestizo Protestants in the Guayaquil area. Protestant organizations were usually divided between predominantly indigenous organizations, such as the Council of Evangelical Indigenous People and Organizations (FEINE), and mestizo organizations. Organized foreign missionary groups working in the country included Southern Baptists, Mormons, Jehovah's Witnesses, and Pentecostals. Other missionaries were nondenominational or affiliated with independent churches. The phenomenal pace of conversion - some observers estimated that evangelicals and Pentecostals totaled 40 percent of the population in Chimborazo Province in the late 1980s - had an impact on social relations in rural areas. Change in religious affiliation was a major rupture with an individual's past traditions and social ties, effectively removing him or her from participation in fiestas - a major focus of much of community life. Families and extended families found the break with the rest of the community easier in the company of fellow converts. Protestantism replaced the patterns of mutual reciprocity characteristic of peasant social relations with a network of sharing and support among fellow believers. This support system extended to migrants; converts who left for the city or the coast sought out their coreligionists for assistance in finding lodging and employment even as Catholics looked to their compadres. NOTE: The information regarding Ecuador on this page is re-published from The Library of Congress Country Studies and the CIA World Factbook. No claims are made regarding the accuracy of Ecuador RELIGION information contained here. All suggestions for corrections of any errors about Ecuador RELIGION should be addressed to the Library of Congress and the CIA. The city of Quito, formerly known as San Francisco de Quito, capital of the Republic of Ecuador, is situated 14' south of the Equator, and 114 miles inland from the Pacific Ocean. It stands at an elevation of about 9300 feet, and has a population of some 70,000, mostly mestizos. It was the capital of the Incas Huaynacapac and Atahualpa, and was burnt by Rumi�ahui in 1533. Sebasti�n de Belalc�zar captured Quito the following year. In 1541 it was made a city by Charles V; in 1565 it became the headquarters of a separate Franciscan province. Quito formed part of Peru till 1718, when it was included in Nueva Granada. The seminary in charge of the Jesuits was the centre of ecclesiastical studies for all middle and northern South America. The Dominicans and Augustinians had high schools in Quito. In 1735 the city was ruined by an earthquake. Independence was declared there on 19 August, 1809; and the following year witnessed a terrible massacre of the nobility, even women and children being put to the sword. President Montes defeated the patriots two years later in the Panecillo; Sucre gained his great victory hard by in 1822. In 1829 Quito became the capital of Ecuador. The city is built on very uneven ground, and the streets run in parallel lines. The most important square is the Plaza Mayor, on the southern side of which is the cathedral, on the eastern the city ball, and on the western the government house. The square was turned into a beautiful garden by President Garcia Moreno, who was assassinated here 6 Aug., 1875. Quito is remarkable for its many beautiful churches, especially the old seventeenth-century Jesuit Church of Santa Ana, San Francisco, La Merced, and El Sagrario. The present university, which was founded by Sixtus V and Philip II in 1586, but opened only in 1621 by the Jesuits, still occupies a portion of the old Jesuit college and has an excellent library, formed in part from that of the San Luis seminary. There are 32 professors and 216 students. The observatory was erected under the direction of the celebrated astronomer Father Menten. Garc�a Moreno invited the German Jesuits to lecture in the university; they have since been expelled by the Masonic parties. The College of St. Ferdinand contains a tablet with a Latin inscription commemorative of the French and Spanish mathematicians who measured the degree of the meridian here in 1736-41. The chief manufactures of the city are woollens, laces, rugs, carpets, and tobacco. There is also a large export trade in religious oil-paintings. 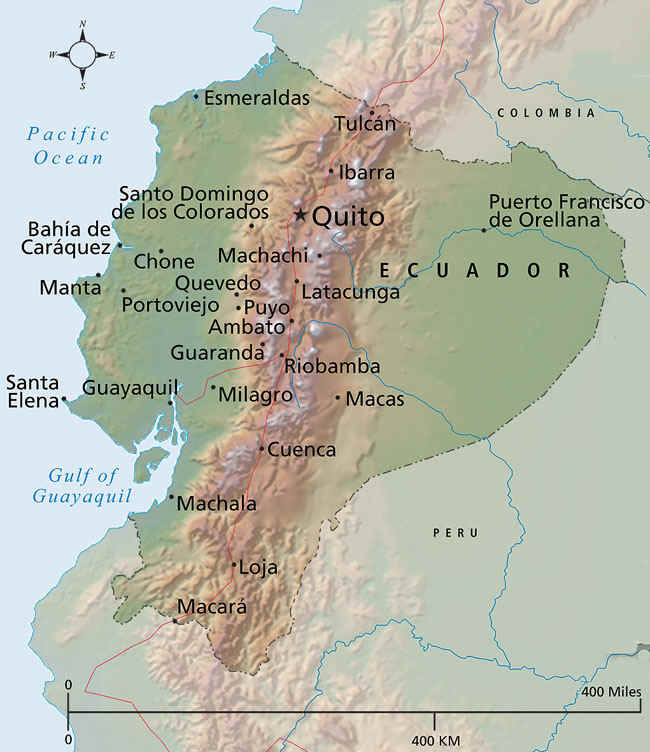 The Diocese of Quito was erected by Paul III on 8 Jan., 1545, at the request of Charles V, and made suffragan of Lima. The first bishop was Mgr. Garcidia, who died in 1563. In 1853 the Holy See proceeded to the beatification of Maria Ana de Jes� de Paredes y Flores, the "Lily of Quito" (b. 31 Oct., 1618; d. 26 May, 1645). By the Bull "Nos semper Romanis Pontificibus" of 13 Jan., 1848, Pius IX made Quito a metropolitan see, with the Dioceses of Cuenca and Guayaquil as suffragans, to which have since been added the Sees of Ibarra, Riobambo, Loja, and Portoviejo. The first archbishop, Mgr Francisco Xavier de Garaycos, previously Bishop of Guayaquil, was appointed 5 Sept., 1851. The present archbishop, Mgr Gons�lez y Francisco Su�rez, was born at Quito 2 Jan., 1845; consecrated Bishop of Ibarra, 30 July, 1895; transferred to Quito, 14 Dec., 1905, and entered into possession on 6 July, 1906, succeeding Mgr Pedro Rafael Gons�lez (b. at Quito, 14 Oct., 1839; Bishop of Ibarra, 29 Sept., 1876; coadjutor titular Archbishop of Synnade, 15 June, 1893, succeeding to the archbishopric in Aug., 1893). The Archdiocese of Quito includes the provinces of Pichincha, Le�n, and Tunguragua, and contains 81 parishes, 195 priests, and 420,560 Catholics. The seminary is in care of the Lazarists. Nestled on the equator (from which the country takes its name) in South America, the Republic of Ecuador is bounded by the Pacific Ocean on the west, Colombia on the north, and Peru on the east and south. It contains some of the highest mountains on Earth. The Sierra, one of the country's three regions, is composed of the high plateaus and valleys between the massive twin mountain ranges of the Andes. This area was the core of ancient civilization in South America and was one of the centers of the Inca empire (fifteenthsixteenth centuries C.E.). The other two regions are the coastal lowlands (known for plantation agriculture, especially bananas) and the Amazon lowlands (known for oil production and various forms of subsistence horticulture). Ecuador claims one of the largest percentages of Indians of countries in the Americas. A strong Indian movement has been influential in Ecuadorian politics, social policy, and culture. The great majority of Ecuadorians are Roman Catholic; Catholic beliefs and practices are sometimes combined with those of indigenous religions. A growing number of people in Ecuador have been converting to Protestant faiths, and the Mormons have established a presence in the country. There are also small numbers of Jews, Baha'is, Muslims, Buddhists, and Hindus. Despite the state's long relationship with the Catholic Church, which was a pillar of colonial and republican society, Ecuador enshrines freedom of religion in its constitution. The state works to ensure religious tolerance in policy and in practice. DATE OF ORIGIN sixteenth century C.E. Once a center of an indigenous state, part of the area that is now Ecuador was conquered in the fifteenth century C.E. by the Incas, who established their state religion of the Sun God. In the early sixteenth century the Spanish conquered the Incas and the indigenous people and took Catholicism to Ecuador. By 1546 the bishopric of Quito had been founded. During colonial times the Catholic Church was an important mainstay of the state and of society, and religious orders such as the Jesuits and the Dominicans expanded Christianity among Ecuador's indigenous population. The church was responsible for education and for much of the social welfare. By the end of the colonial period it had acquired enormous wealthmuch if not most of it gained through coerced labor performed by indigenous people and Africans imported as slaves. The region, as part of Gran Colombia, won independence from Spain in 1822; it split from Colombia to became the Republic of Ecuador in 1830. Ecuador's early republican period was marked by struggles between liberals and conservatives over the place of the church in civic life. By the end of the nineteenth century the liberals had obtained the upper hand. Religious pluralism was guaranteed in Ecuador, and the relationship of the church to the state was severely limited. The state abolished tithing (taxing to support the church) and established a system of secular public schools. Nonetheless, the Catholic Church as an institution maintained considerable influence in Ecuador. In the mid-twentieth century the church became interested in issues of social welfare and in the problems faced by the numerous poor Ecuadorians and began organizing social assistance. It also became concerned about the place of Indians in Ecuadorian society. This coincided with the rise of a powerful Indian movement in the country and the rapid growth of Protestantism among indigenous peoples. A high point of Ecuadorian church life was the 1985 visit of Pope John Paul II. He toured the country, bringing a substantial public visibility to Ecuadorian Catholicism. The first bishop of Quito, Garc�a D�az Arias (died 1562), was appointed in 1546. Initially the cathedral in Quito was made of adobe walls and a thatched roof. It was D�az Arias who began construction of the present cathedral in the city. At the turn of the twenty-first century the leaders of the Catholic Church in Ecuador included four archbishopsRa�l Vela Chiriboga (born in 1934; appointed an archbishop in 2003), Antonio Arregui Yarza (born in 1939; made archbishop in 2003), Vicente Cisneros Dur�n (born in 1934; appointed archbishop in 2000), and Jos� Mario Ruiz Navas (born in 1930; became an archbishop in 1994)and one emeritus arch-bishop, Luis Alberto Luna Tobar (born in 1923; archbishop 19812000. Le�nidas Proa�o (191088), bishop of the Ecuadorian diocese of Riobamba, influenced the development of liberation theology in Latin America. He is commonly known as the "Bishop of the Poor" and the "Bishop of the Indians." He believed the church had an obligation to encourage the development and organization of disadvantaged people. Bishop Proa�o's work included strong support for indigenous Ecuadorians. The Instituto de Pastoral Latinoamericano (Latin American Pastoral Institute), established in the early 1960s, played an important role in the formation of liberation practice by providing information and training for priests and nuns and by encouraging pastoral innovation. Catholicism in Ecuador maintains a hierarchy of places of worship, from cathedrals to local chapels. There are also shrines that house figures of particular importance to the country; significant examples include the Sanctuary of the Virgin of Quinche (which contains the image of the patroness of Ecuador) and the seventeenth-century Sanctuary of Guapulo in Quito (which contains an important image of Our Lady of Guadalupe). Ecuadorian Catholics maintain devotional practices similar to those of Catholics around the world. To this end, they have a network of holy patrons. The country as a whole, as well as each region and each town, has its patron; this is either a saint, a particular apparition of the Virgin Mary, or a figure of Jesus. The national patroness is Nuestra Se�ora de la Presentaci�n del Quinche (the Virgin of Quinche). This image of the Virgin Mary was carved in the sixteenth century and is associated with legends of the Virgin's miraculous appearance to a group of Indians. As the patron saint, she connects a history of her image with the national history in ways that are highly significant for many of the country's Catholics. In the month of November the Virgin of Quinche draws pilgrims from the major ethnic groups of Ecuador; she thus serves as an image of an ethnically united nation. Ecuadorian Catholics recognize the standard holidays of international Catholicism. Given the historical connection between Ecuador and the Catholic Church, some festivals (such as All Souls' Day and Christmas) are also official holidays. Standard festivals from the Catholic calendar, including the Feast of the Epiphany and Holy Week, are celebrated in Ecuador. Also important are feasts for local patrons, such as the Virgin of Quinche (in November) and Saint John in Imbabura (in June). In addition, these festivals overlap with folkloric events that draw on Catholic tradition. A well-known example is the Mama Negra (black mother) Festival in Latacunga, which combines a celebration of the Earth's fertility with honoring the Virgin of Mercedes, the town's patron saint. Ecuadorian Catholics do not wear any clothing distinctive to their religion. Particular groups of highland Indians, such as the Saraguros and the Otavalos, have distinctive forms of dress, and these are worn by Catholics from these communities. Ecuadorian Catholics do not have particular food restrictions. Certain traditional dishes are served for particular feasts. For example, during Holy Week (Easter) Ecuadorians serve fanesca (a stew made of fish and a number of grains), and in the area around the city of Cuenca it is customary to eat mote pata (a dish made with hominy and pork) during Carnaval, the festival preceding Lent. Catholicism in Ecuador follows the standard rituals of international Catholicism. In addition, there is a history of popular devotion and ritual that stems from two sources: historical Iberian Catholic practice and syncretism with indigenous traditions. Popular religiosity stresses many public acts of devotion, such as pilgrimages and participation in patron saint festivals, as well as domestic rituals of devotion to religious figures (including popular saints). For Catholics in Ecuador, the standard rites of the Catholic Church (including baptism, first Communion, and marriage) mark the major rites of passage. In rural popular Catholicism and portions of urban Catholicism, it has long been an important rite of passage to sponsor feasts tied to patron saints. This system connects secular and political prestige with religion. The growth of secularity and non-Catholic religion has somewhat weakened this system. After the Latin American Bishops' Conferences in Medell�n, Colombia (1968), and Puebla, Mexico (1979), the Ecuadorian church concerned itself with issues of social injustice. As a result, it developed particular pastoral approaches directed at strengthening membership among Ecuador's Indian and black populations as well as at social issues affecting these groups, such as poverty and migration. Among other things, the church embraced the notion of inculturation, the idea that, rather than being bound to a single vision of Catholic life and practice, the gospel may be understood within the cultural norms and practices of the different groups that compose a country. Thus, the Euadorian church has developed a theology and practice for Ecuador's Indians and another for its black population. The Catholic Church uses media such as radio to communicate with the Ecuadorian people. Catholic universities, including the Salesian Polytechnic University and the Catholic University of Ecuador (both in Quito), are also influential in maintaining the church's membership. The Catholic Church has been a critical voice of social justice in Ecuador, supporting the organization and political action of the indigenous population as well as being deeply concerned about the welfare of the country's poor. It has organized nongovernmental organizations to participate in social development. It also maintains a network of schools as well as one of radio stations and other media to educate the Ecuadorian people. The order of Salesians in particular were notable for their indigenous advocacy efforts. These included forming the Shuar Federation in 1964, primarily to preserve the native Shuar people's land rights, and creating an indigenous-based publication series called Mundo Shuar. The Ecuadorian Catholic Church follows the social teachings of the Vatican. The majority of Catholic families in Ecuador are nuclear families, but a common practice is to augment the family support system by naming compadres (godparents) for a child at his or her baptism. Given the historical relationship between the Catholic Church and the nation, as well as the fact that the vast majority of Ecuadorians are Catholic, Catholicism is prominent in political life. The constitution separates church and state, but, nonetheless, the Ecuadorian Bishops' Council gives pastoral comments on social and political affairs in the country. As mentioned above under SOCIAL JUSTICE, the church provided a foundation for the Indian movement, which became a powerful political force in the 1990s. It has been estimated that at least half of Ecuadorians use some form of contraceptives, even though the Catholic Church forbids it. Abortion remains illegal under Ecuadorian law. While the Catholic Church in Ecuador takes a conservative stance on a range of social issues, such as sexuality, marriage, and the family, it also opposes the dominant social and economic order, and many Ecuadorians see this as controversial. Many aspects of Ecuadorian national culture developed in the embrace of Catholicism. Quito, the capital of Ecuador, was an important colonial city. It became a center for a style of colonial religious art called the Quite�o school, which combined European baroque with indigenous elements and is known for its brilliant colors. The religious buildings of the colonial era were often elaborately decorated in this style, as seen in the rich interiors of many of the churches in Quito's historical center. The colonial period left gems of religious architecture that today serve as symbols of Ecuadorian national culture. One example is the Metropolitan Cathedral, in the center of Quito, which dates back to the sixteenth century. In the religious feasts held during popular festivals, a style of music and dance developed that now forms one of the main elements of the national folklore. Indigenous religiosity is an important part of Ecuador's religious life. While much of itparticularly in the case of highland Indianshas been embedded within Catholicism as a form of what is called popular Christianity, it also maintains a recognizable indigenous form. With the development of a strong Indian movement (beginning in 1964 with the establishment of the Shuar Federation), there has been pressure to organize an Indian religion separate from Christianity. A resurgence of indigenous-based forms of religiosity has converged with the Ecuadorian indigenous political movement, with the international indigenous movement (particularly around 1992, with the observation in the western hemisphere of the Columbian Quincentenary), and with a global New Age movement tied to environmentalism and tourism. Indians and their religious expression are idealized perhaps as never before, which serves to simultaneously distort and protect them. Indigenous religiosity of the highlands emphasizes a notion that people are related to the landscape and the elements of nature, such as the earth, sky, sun, moon, and stars. The mountains, for example, are thought to contain the principles of life and to be greater than human beings. As a result, offerings are often made to each mountain to bring it into a social relationship and to guarantee its goodwill toward people. The best known of these mountains is perhaps Mount Imbabura in northern Ecuador, which is believed to have the power to impregnate women who travel alone and unprotected in its flanks. Dreaming is important as a means of divining the immediate future and the conjunction of forces in the world around an individual. The world is seen as filled with omens, some portentous and some beneficent. Religious specialists and healers are contracted to divine and transform the balance of forces in the world for the benefit of individuals, families, and communities. While the majority of Ecuador's Indians reside in the highlands and speak one form or another of Quichua (a type of Quechua, of which there are many versions throughout the Andes), there is also a significant and different population of Indians in the eastern lowlands (such as the Shuar, the Achuar, and the Huaorani) and smaller groups of indigenous peoples (such as the Ts�chila and Chachi) in the western Andean foothills and Pacific coastal area. These groups maintain a distinctive cosmology related to that of other Amazonian peoples. An important part of their religious life involves shamans who often ingest hallucinogens, such as ayahuasca (a drink produced from the vine Banisteriopsis caapi), as part of their shamanic journey to confront the universe and to bring order to human lives. While indigenous religions continue to maintain their power, large numbers of Indians in Ecuador have converted to various forms of evangelical Christianity. Different regions have been heavily influenced by one missionary organization or another (such as the Gospel Missionary Union, World Vision, and the Summer Institute of Linguistics). There also has been a growth of indigenous Ecuadorian Protestantism. As in other Latin American countries, Pentecostalism has become increasingly important among Ecuadorians. The Church of Jesus Christ of Latter-day Saints has also substantially grown in Ecuador, developing a notable presence among the Otavalo Indians of Imbabura province. Ecuador's Jewish community is mainly concentrated in Quito. Small numbers of people in Ecuador are Baha'i, Muslim, Buddhist, and Hindu. Bottasso, Juan. Los shuar y las misiones: Entre la hostilidad y el dialogo. Quito: Mundo Shuar, 1982. Crespi, Muriel. "St. John the Baptist: The Ritual Looking Glass of Hacienda Indian Ethnic and Power Relations." In Cultural Transformations and Ethnicity in Modern Ecuador. Edited by Norman E. Whitten, Jr. Urbana: University of Illinois Press, 1981. Goffin, Alvin M. The Rise of Protestant Evangelism in Ecuador, 18951990. Gainesville: University Press of Florida, 1994. Harner, Michael. The Way of the Shaman: A Guide to Power and Healing. New York: Harper & Row, 1980. Jouanen, Jose. Los Jesuitas y el oriente ecuatoriano: Monograf�a Historica 18681898. Guayaquil, Ecuador: Editorial Arquidiocesana, 1977. Moya, Luz del Alba, ed. La fiesta religiosa indigena en el Ecuador. Cayambe, Ecuador: Abya Yala Press, 1995. Muratorio, Blanca. The Life and Times of Grandfather Alonso: Culture and History in the Upper Amazon. New Brunswick, N.J.: Rutgers University Press, 1991. Salomon, Frank. "Killing the Yumbo: A Ritual Drama of Northern Quito." In Cultural Transformations and Ethnicity in Modern Ecuador. Edited by Norman E. Whitten, Jr. Urbana: University of Illinois Press, 1981. . "Shamanism and Politics in Late-Colonial Ecuador." American Ethnologist 10, no. 3 (1983): 41328.